Leave a message for Louise using the form fields below. If you have any questions, please contact us at (212) 269-7800. For general inquiries, email compliance@ingalls.net. 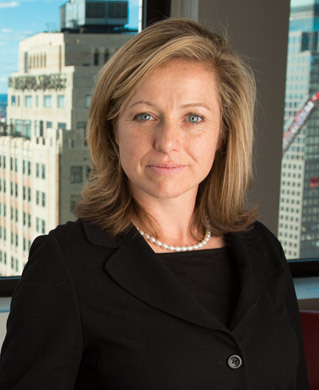 Louise Weston is a Senior Vice President and portfolio manager. She works to build balanced, diversified, and tax efficient portfolios as appropriate for individuals, retirement accounts, trusts and families. Louise searches for well-priced securities with growth potential in domestic and international markets. Prior to joining Ingalls & Snyder, Louise practiced corporate law at Simpson Thacher & Bartlett, and at Debevoise & Plimpton. She also managed associate development and recruitment at Cadwalader Wickersham & Taft. Louise earned her B.A. from Lehigh University in Classical Civilization with minors in Geology and Journalism, and holds a J.D. from University of Pennsylvania Law School, with courses at the Wharton School of Business. Louise Weston joined Ingalls & Snyder in 2011, became a Vice President in 2013, and a Senior Vice President in 2015. Louise enjoys cycling, photography, English football and walking her honey badger-chihuahua mix.